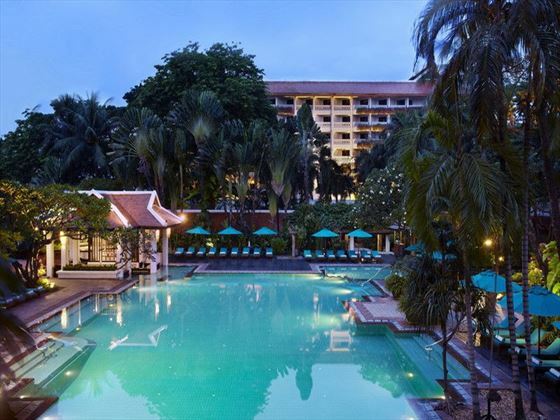 The resort enjoys a fabulous location right on the banks of the Chao Phraya river close to many of Bangkok's major highlights with complimentary boat transfers from Saphan Taksin skytrain terminal enabling easy access for visiting guests. 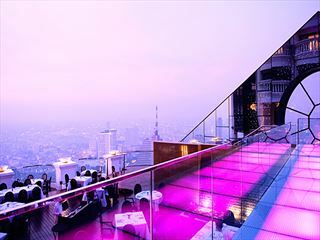 Suvarnabhumi International Airport is approximately 45 minutes from Anantara Riverside. Guest accommodation is divided into the following types. All Deluxe rooms sleep 2 adults and 1 child maximum. 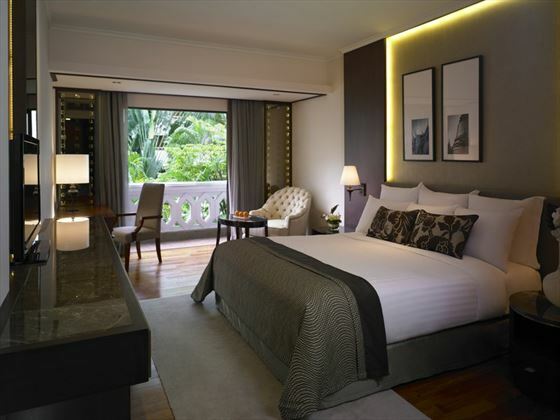 Deluxe Room – stylish and comfortable rooms with one king-size or two twin beds, high ceilings, large windows and private balcony views over the city or gardens. Deluxe Riverview – same style and size as the Deluxe rooms with the added luxury of direct river views from the private balcony, marble bathrrom with rain shower. 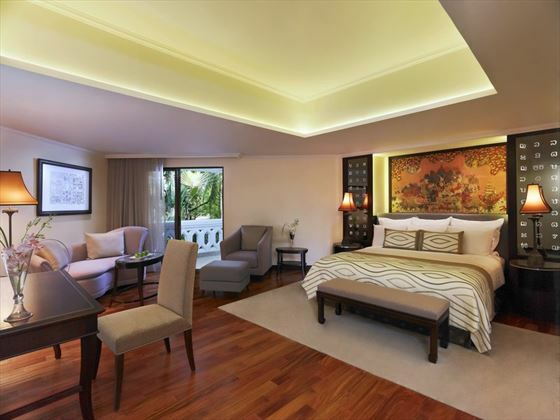 The below suites offer complimentary access to the Club Lounge. 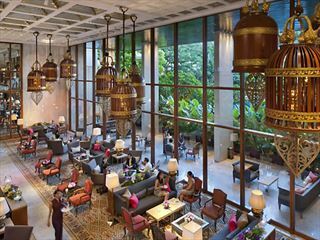 Kasara Lounge benefits include daily breakfast, afternoon tea 2-4 pm, cocktails and refreshments as well as private check in and check out services, unlimited Wi-Fi internet access and spa discounts. 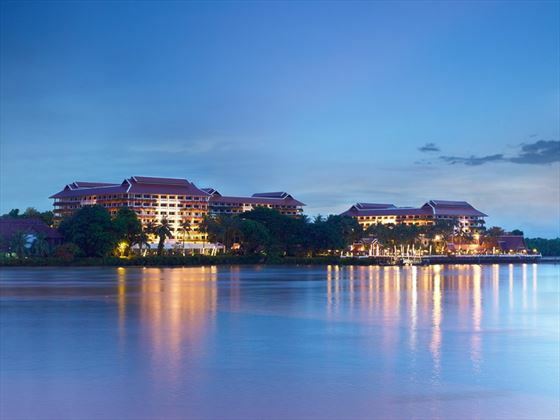 Junior River View Suites – Larger room with Chao Phraya River views from the spacious balcony, spacious lounge area, bathtub and rain shower as well as Kasara Lounge benefits. Anantara Riverfront Suites – Larger than Junior Suites with private wrap round balcony, spacious bathroom with bathtub and rain shower, upgraded technology and amenities, separate living room with full sofa set and dining area with two LCD TV's as well as Kasara Lounge access and great views over the gardens, city and river. 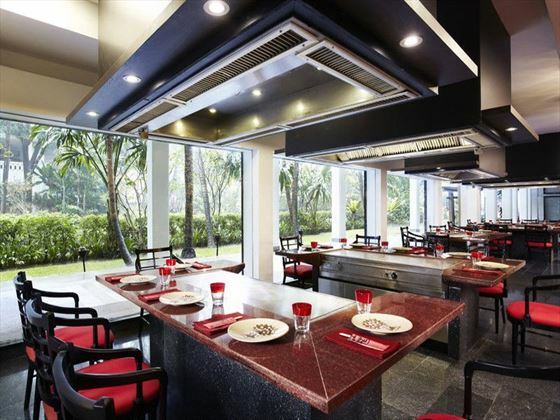 Benihana – classic Japanese cuisine and Teppanyaki stations served for lunch and evening meal. Brio – family-favourites all round at this authentic Italian restaurant that opens for lunch and evening meal. 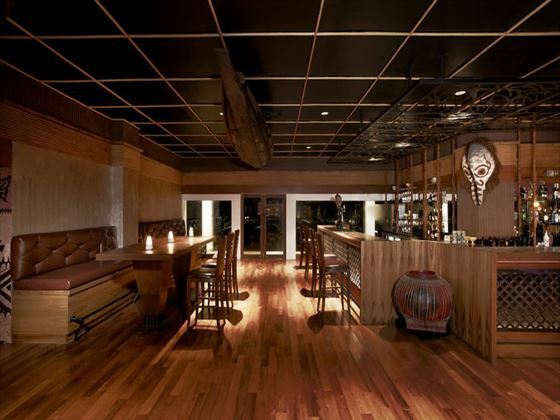 Trader Vic's – Pacific-rim specialities served every evening within a Polynesian bar setting. Riverside Terrace – international buffet delights presented every evening from 6pm–10.30pm. The Market – the place to be for making the most of a highly-acclaimed international buffet breakfast. 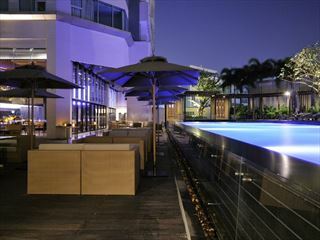 Loy Nam Bar – cocktails, drinks and snacks by the pool with a 4pm–6pm happy couple of hours. Longtail Bar – drinks, cocktails and lighter menu items served alfresco on the banks of the river. Numero Uno Café – cakes, coffee and typical deli and bakery goodies. Manohra Cruises – enjoy the very best of Thai cuisine on-board a traditional cruise boat. Dining by Design – regional and international menu items presented in the privacy of your own choosing for the ultimate in romantic meals for two. 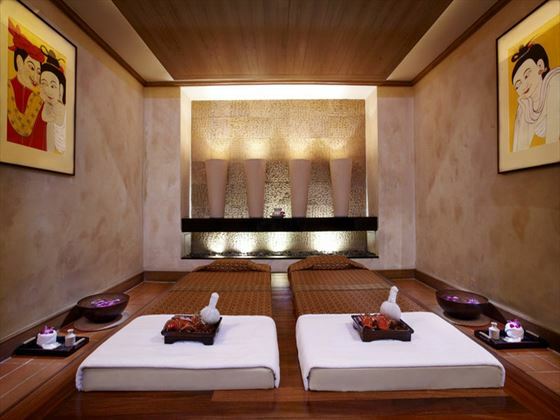 Anantara Spa – featuring two couples' suites, nine individual treatment rooms and an outdoor garden courtyard with rain shower and traditional Thai sala from where to indulge in a full complement of all over body treatments, traditional rituals and signature massages. 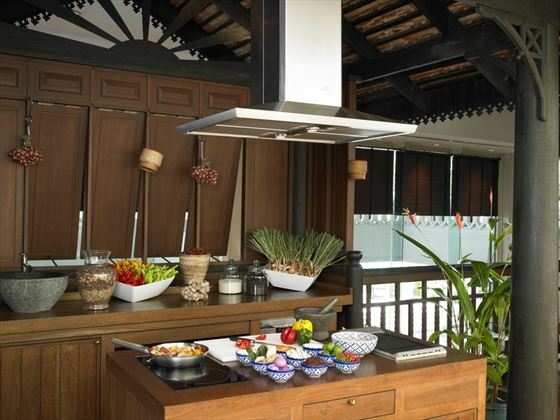 Spice Spoons – this cooking school enables guests to learn all the secret ingredients and recipes that are needed to recreate some of the world's most popular Southeast Asian dishes. Fitness suite with cardi and muscle strengthening equipment alongside personal trainers and daily step, aerobics and Yoga classes. Chang Noi Kids' Club – supervised sports, arts and crafts for little ones including pizza making, sushi making, Thai dancing and soccer etc. 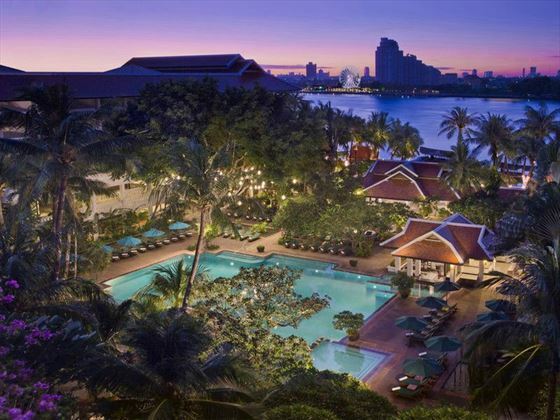 The outdoor pool is one of the largest in Bangkok and has a shallow end for children.